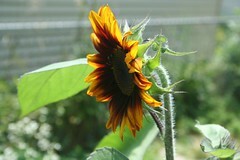 There are sunflowers along my route to work, which get up to and past ten feet tall. It’s likely true that the main purpose of sunflowers worldwide is for seeds and oil. However, they serve an even more useful purpose for me: they brighten my day, and remind me to appreciate life, summer, and the glorious sun. Wow! I’ve got three, growing in my backyard. They are of a different variety than this one, which I grew two years ago. I’m excited to see the blooms!